Britalian is the new BuzzWord this week on Macmillan Online Dictionary. It’s one of these classic nomenclatures that save you a syllable when having to describe someone who’s of both British and Italian descent, or an Italian who has emigrated to the UK from Italy. Might I suggest the future use of Americanadian, Thailandorran, Vietnamibian and Perussian? Don’t bother trying to think of any more; I scoured my atlas from cover to cover, you’ll only show me up. 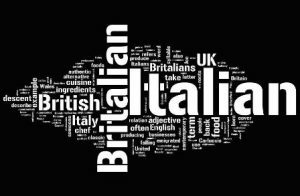 Usually Britalian refers either to famous people or foods, since people and food are what Britain most often take from Italy. Sometimes feisty Italian chefs (Antonio Carluccio helped bring the term to national attention) and even the Italian government object to dilution of their national culinary culture. But some British businesses are having a go at replicating authentic Italian cuisine with home-grown produce. Mmm, I want ‘a pizza’ that action.